It was not to be for Zharnel Hughes and Kyle Langford as Team England’s frustrating week on the Gold Coast continued. Both athletes had gold in their sights – in Hughes’ case he even completed a lap of honour thinking he was the winner – but both cruelly were denied track titles. In dramatic races on Thursday evening in the Carrara Stadium, Hughes finished first in the men’s 200m final, only to be disqualified for a lane infringement, while Langford finished his 800m final like a train but ended up five hundredths of a second behind Wycliffe Kinyamal as the Kenyan held on desperately to his lead. Hughes was always in control in his 200m final as the 22-year-old, who was born in Anguilla but who has represented Britain – and here England – since 2015, came into the home straight with a clear gap on his rivals. Jereem Richards, however, began to run Hughes down and in the final metres the right arm of the Trinidad & Tobago sprinter, who was drawn on the lane inside Hughes, clashed with the left arm of the leader. Hughes was knocked off balance and he staggered over the line in a time of 20.12. Richards was also awarded the same time, but Hughes was given the verdict on the photo finish and he set off on a victory lap. But while he was celebrating, judges were analysing the race and they ruled that Hughes was guilty of a lane infringement. Certainly, in the final few metres, it was clear Hughes at least stepped on the white line that separated him from Richards and it may have contributed to the clash of arms. It took a number of minutes before Hughes was told he had been disqualified. Finally, when a judge broke the bad news, his disappointment was obvious but it did at least bring success to Northern Ireland’s Leon Reid, as he was elevated to a bronze medal after a 20.55 clocking, as Aaron Brown of Canada took silver. With Team England making a protest, the medals ceremony was postponed until Friday, although it was confirmed 90 minutes after the 200m final that the protest had been rejected. Langford’s race unfolded in very different fashion but was equally frustrating for the Englishman. 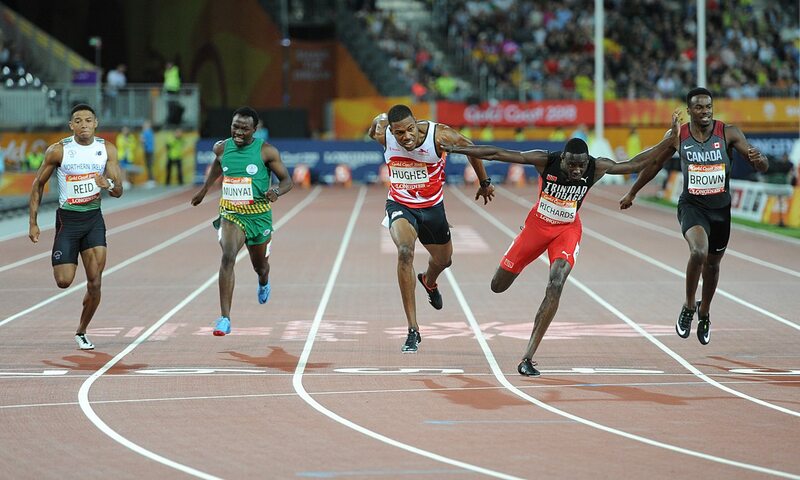 After reigning champion Nijel Amos of Botswana led the field through 400m in 52 seconds, Kinyamal surged to the front with 250m to go and looked the likely winner coming into the home straight. Langford, meanwhile, had a lot of work to do as he was only in sixth place and well adrift with 100m to go. 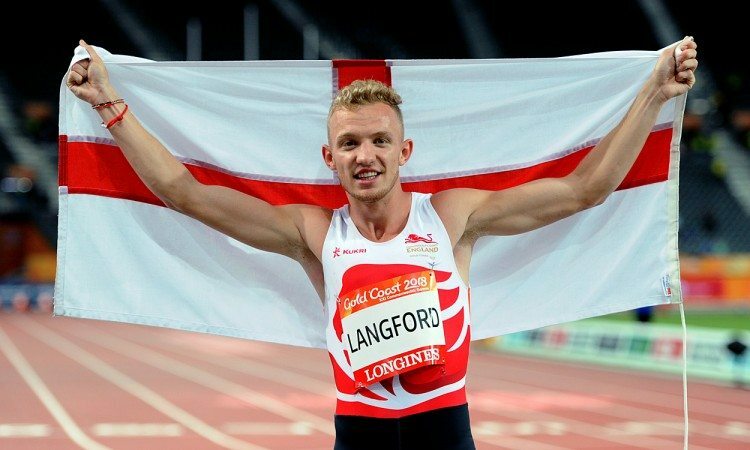 But, similar to the London 2017 final where he finished strongly for fourth, Langford uncorked his big kick and almost caught the Kenyan in a thrilling finish as he ran a PB of 1:45.16 to miss out on victory by a fraction. “I knew I had it in me to win, it’s what I’ve been envisaging at every training session – to win gold,” said Langford, who nevertheless became the first medallist from the home nations in this event since Matt Yates in 1990. “So to come short, it’s gutting but it’s one of those things. Behind, Luke Mathews of Australia also finished quickly for bronze while Jake Wightman of Scotland ran well for fourth in 1:45.82 and heads now into the 1500m looking to make the podium.